Left to right: Ann Smart (ALCGA Captain), Maryla Sime, Colette Robertson, Mary Robinson, Mary Horn, Kimberley Beveridge, Shannon McWilliam, Carmen Griffiths, Ros Dunsmuir (ALCGA President). Another picture by Karen Stalker below the scores. Aboyne 1, represented at the Newmachar Golf Club venue by their outstanding young players Shannon McWilliam, Kimberley Beveridge and Carmen Griffiths, and Maryla Sime, won the Aberdeenshire women's county team tournament for the Mrs Watt Duffus Trophy for the second year in a row with a total of 232. Newmachar 1 won the Handicap Trophy with a total of 226. Gillian Mackenzie (Banchory) won the Mrs J P Kennaway Cup for the best individual score with a 75. The Individual Handicap Trophy was won by Cruden Bay's Colette Robertson with a net 70 off 15 of a handicap. 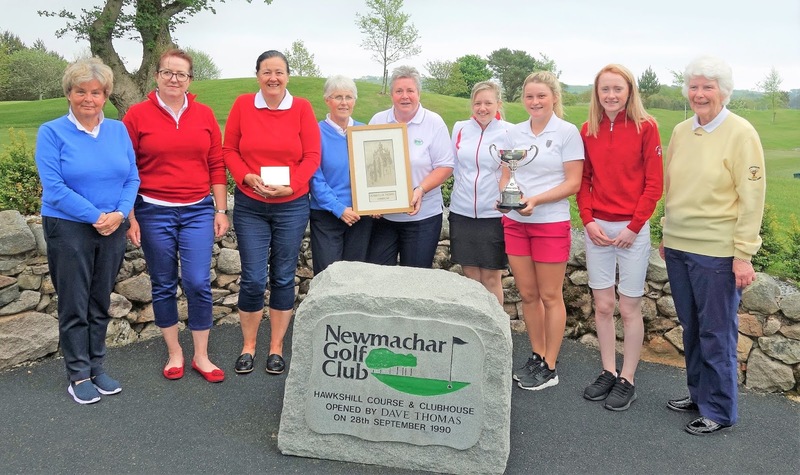 Newmachar 1, winners of the Handicap Trophy. 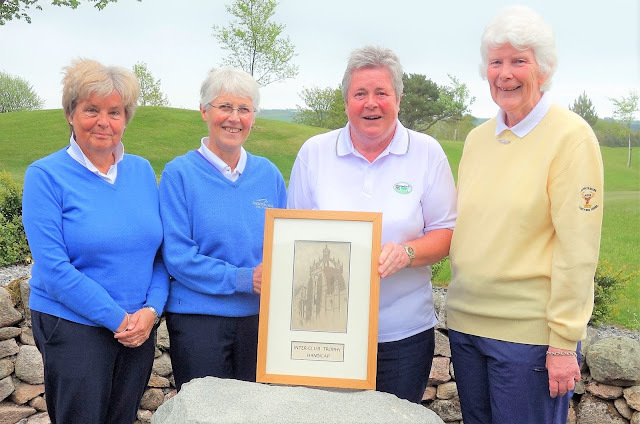 Left to right: - Ann Smart (ALCGA captain), Mary Robinson, Mary Horn and Ros Dunsmuir (ALCGA president). Missing from the photo are Alison Hope and Kerrin Thomas who were not able to stay for the prizegiving. Picture by Karen Stalker.